On the heels of the major update to Delicious, Yahoo has minorly updated its another service MyBlogLog too. There isn't much changes in the functionality of MyBlogLog, except a few rearrangements. 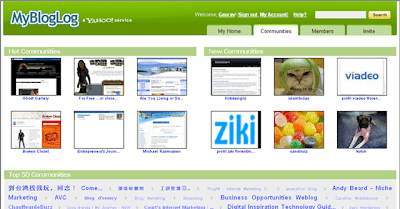 The most noticeable Change is that the site color has changed from Plain Green to Glossy Green. Rest all of the features have remained same, except that Recent profile Visitors block has been shifter to the left sidebar. Links : MyBlogLog | Join our Community | What is MyBlogLog?